Bay St. Louis recovers from Hurricane Katraina. 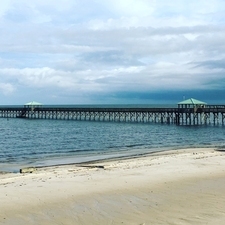 The Mississippi Gulf Coast continues to rebound and strive since Hurricane Katrina made landfall in 2005, and nowhere is this resurrection more profound than Bay St. Louis. In addition to its long-standing restaurants, antique shops and fun boutiques, the historic town fronting the bay and Gulf of Mexico is now home to a new 160-slip marina and seawall with new businesses popping up constantly and special events happening year-round. A great place to stay in the heart of the action is the comfortable Bay Town Inn, a bed and breakfast with 10 king suites and two larger accommodations that are perfect for family reunions. Owner Nikki Moon rebuilt the property following Katrina and it now includes an oversized porch with rocking chairs with all rooms facing a salt-water pool. Each room includes a stocked kitchen, sitting area and décor featuring local artists. Dogs under 25 pounds are welcome too. Another bed and breakfast to consider is Alice Moseley’s “Blue House,” the former residence of a Bay St. Louis artist fond for colorful creations. Moseley taught herself to paint while caring for her mother who suffered from Alzheimer’s while living in Batesville, Miss. She began traveling and selling her work, which brought her to the coast. Moseley settled in Bay St. Louis at age 79 and painted her new home a bright blue, hence the name. The B&B is located near the 1876 train depot, now used for the Alice Moseley Folk Art & Antique Museum where her art and life history is on colorful display. Restaurants run the gamut in Bay St. Louis. The Mockingbird Café offers casual breakfast, lunch and dinner in a house that doubles as an art gallery and coffee shop. There’s local beers served as well, plus live entertainment on special evenings. Sunday brunch on the porch enjoying their creative egg dishes, specialty coffees and Deep South biscuits with pear butter is a must. A unique place to dine is the Starfish Café, run by the PNEUMA-Winds of Hope organization dedicated to training adults in the culinary arts and life skills. Staff serve up menu items and daily specials that don’t come with a price attached; diners pay what they can. Located in another colorful house in town, the Starfish Café is surrounded by outdoor art pieces and vegetable gardens, the latter of which is used in the cooking. Several blocks of Old Town Bay St. Louis are filled with boutiques, antique shops, a bookstore and Serious Bread bakery, which serves up freshly made breads and other sweet delights. On the second Saturday of every month, the town hosts Second Saturday Artwalk with two designated “hotspot” businesses per month. Last month’s hotspots, for instance, were Cuz’s Old Town Oyster Bar & Grill and The French Potager gift shop. Getting around Bay St. Louis is a breeze, thanks to the free Old Town Trolley that cruises from the Silver Slipper Casino through the old town with scheduled stops in Waveland at Buccaneer State Park to the southwest of town. Bike and golf cart rentals are another fun alternative. A unique and historic spot that’s off the beaten path is the St. Rose de Lima Catholic Church. Built in 1926, the church features an uplifting “Christ in the Oak” mural, two pulpits built from oak trees and the nationally known St. Rose Gospel Choir. For more information on what’s happening along the Mississippi Gulf Coast, visit www.gulfcoast.org.